This embossed copper bracelet features otorcyclles. This copper bracelet is about 5/8" wide (15 MM). It has six powerful magnets to improve health. This bracelet can be adjusted a bit bigger or smaller by bending slowly. Wearing copper jewelry is said to be beneficial for people with conditions such as arthritis or lupus. 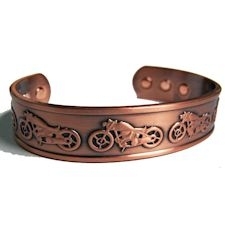 This copper motorcycle bracelet can be shipped internationally. This product was added to our catalog on 12/19/2017.